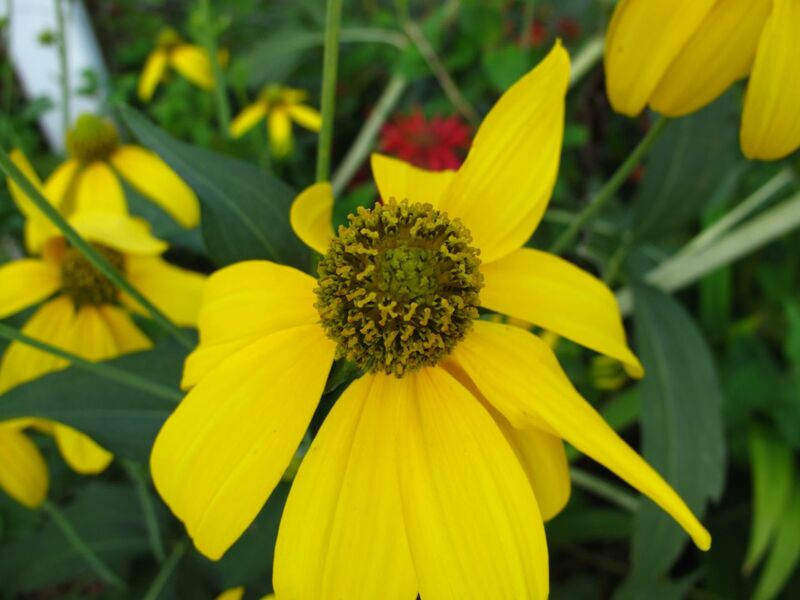 Rudbeckia hirta ‘Irish Eyes’ cheers up the southern entrance to the garden this week. The long stalks, blown over in a storm, rest amid some Monarda that is enjoying an extended blooming period. Yellow and red are not a favored color combination in my garden, but the monarda is not usually blooming at this time of year. In general the garden is doing better than average for August. Almost all the blooms are happenstance, much appreciated happenstance. 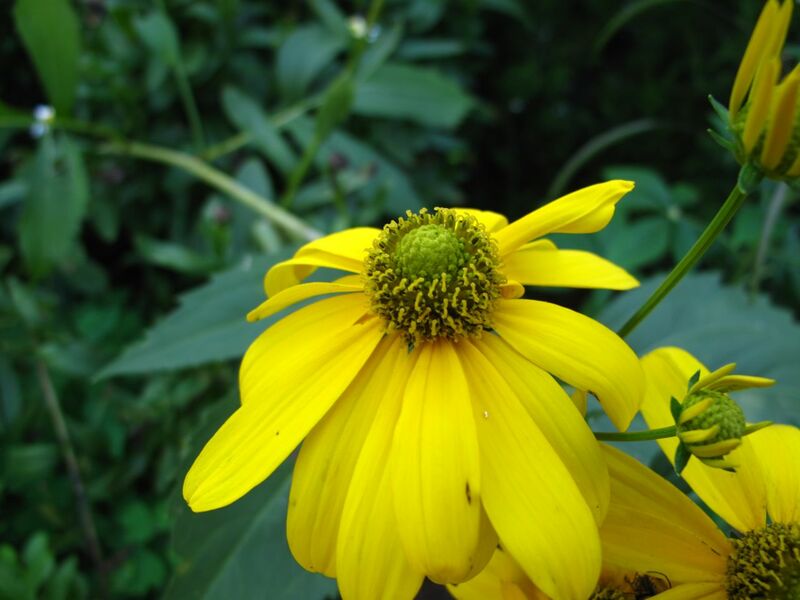 This entry was posted in garden and tagged beebalm, Monarda didyma, nature photography, perennials, photographing nature, Rudbeckia hirta 'Irish Eyes' on August 18, 2012 by pbmgarden. I’s a lovely cheerful plant and looks nice next to red. 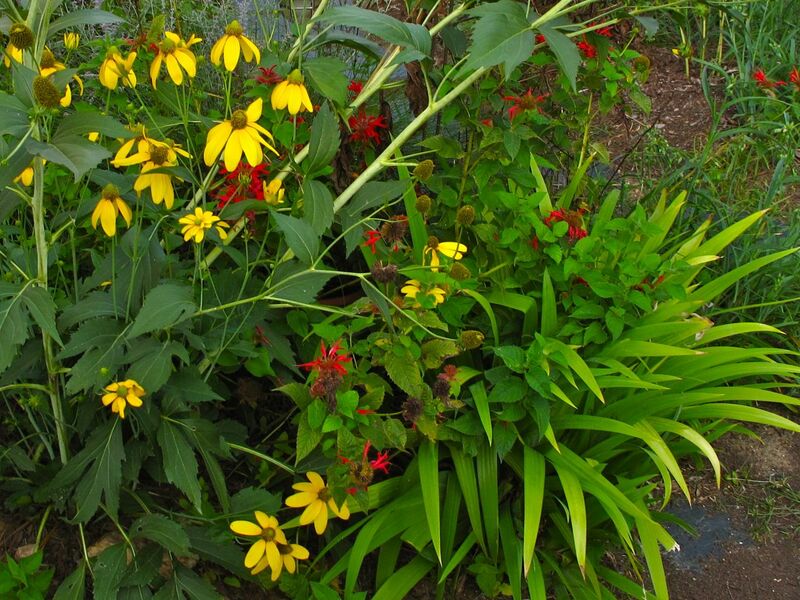 I tried growing Rudbeckia once, but I think my garden is too dry for it. This is the only variety I’ve had much luck with. Many of my plants that are supposed to do ok even in dry weather are much more vigorous this summer because of good amounts of rain. Rudbekias are such cheerful plants, just like a splash of sunshine on a dull day! Your variety ‘Irish Eyes’ has a lovely flower and looks quite autumnal with the red of your Monarda, autumn is coming too quickly! I feel autumn is coming (too soon) also. There’s something detectable in the air and of course, the daylight is noticeably shorter. I have too many Shasta Daisies. Black-eyed Susans are ubiquitous around here but I can’t keep them growing. 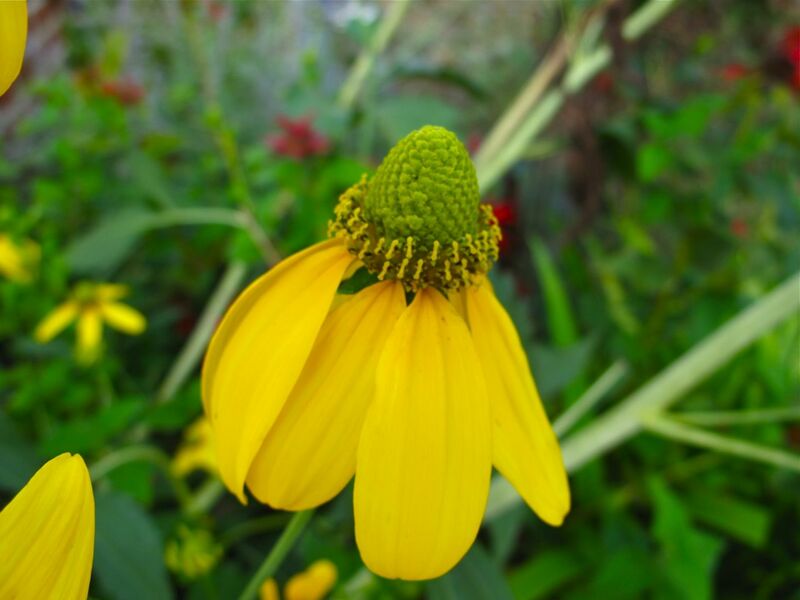 Don’t understand it, but this particular Rudbeckia has done well for years. You have convinced me that my garden needs Irish Eyes. Thanks. Great, I think you’ll enjoy it. The name comes from the green center. Beautiful contrast. I thought I didn’t want anymore Rudbeckia in my garden since they self-sow like crazy, but after looking at your ‘Iris Eyes’ I’ve changed my mind.